"For months after I first moved to Nashville, a billboard by the westbound I-40 advertised an alcohol addiction recovery program. But what caught my eye was the billboard's photograph: the coldest, frothiest, most delicious-looking pint of beer that has ever been poured. I never wanted a beer more than I did when I drove past that billboard. And I am not an alcoholic. I wonder how many of the hundreds of people suffering from addiction passed that spot every day and were perversely tempted—not to enter rehab, but to pull off at the next exit for a tall, cold one. Marketing has problems if it makes the consumer pant for the dead opposite of what you are trying to sell. " What does it take to convince people to become fully devoted followers of Jesus Christ? "Church history has taught us that a leader can do more through a handful of totally devoted believers than through a church full of halfhearted ones. So we're left with a tension: How can we teach in such a way that we produce fully devoted followers of Jesus Christ, when we know that most people don't want to hear about radical discipleship?Let me suggest five principles that guide me when I preach for 100 percent commitment." Another year has passed and a new year has just begun. We have many reasons to thank the Lord for His blessings, protection and guidance. Among numerous things during 2008 we would like to focus on two main decisions we made during the year. In the beginning of the year we understood more and more that the values of today were created on internet and not in the churches. We saw, even in Christian blog-sites and communities, a lot of confusion about Christian moral, ethics, values and beliefs. We felt a call from the Lord to be present on the arenas were today´s values were formed. So we started our Christian web-site http://www.rupeba.se/ to be a voice among many other voices and to present and defend Christian values in a postmodern world. Our web-site has had many thousands of visitors since we started the 1st of April 2008. On the web-site we have also published a daily devotion: DAYS - tiny thoughts for great days, written by Ruth. Just before Christmas we gathered all devotions for one year and published them in a book. We have also published two e-books during the year. From January 2009 we will also include an English version on our web-site. Welcome to visit us there. 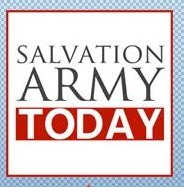 The second main event during 2008 was when the Salvation Army leadership in Sweden asked if we would be willing to take responsibility as Regional Commanders for the Salvation Army operations in Latvia. We felt guided by the Lord to accept the challenge and as a consequence of that we will be appointed Salvation Army Officers before we move to Riga the 1st of July 2009. For the moment we are studying Latvian language and history. You can expect news from Latvia regularly on our web-site. A main event in 2009 will of course be our move to Riga and starting our work in Latvia. But before that we have a of lot of speaking engagements, courses and conferences, language studies waiting during the coming spring semester. So we really need your prayer support…..
Time Magazine presents the Top 10 Religion Stories of 2008. "I’ve already written a post on my impressions from my visit to the New Wine summer conference “Kingdom come” (can be found here). As I went through my notes I found some from a seminary called “The top 10 tasks of Christian leadership”. Sometimes I get a bit suspicious about top-lists (even though I like to use them occasionally), however I found this seminar both helpful and interesting. I belong to the group of people who strongly believe that there truly is a difference between Christian and other types of leadership. This is something that becomes visible in the first (and most important) point in this list, presented by Will Donaldson, director of Christian leadership at Wycliffe Hall in Oxford, who shared from his extensive experience.